According to initial inputs, a suicide bomber hit a Frontier Constabulary truck in Quetta's Zarghoon road in the high-security Red Zone, around 300 metres from the provincial Assembly building. A major bomb blast near Pakistan's Balochistan Assembly on Tuesday killed six persons including four policemen and injured 17 others, hours after provincial Chief Minister resigned from his post due to political instability, media reports said. "It is a clear act of terrorism but we are still trying to determine whether it was a suicide bomb attack," a senior police official said. A special session of the Assembly had been called to take up a no-confidence vote against Balochistan Chief Minister Sanaullah Zehri but was postponed after he resigned from his post, amid speculation of 'horse trading' as the government and the Opposition had claimed to have enjoyed the support of a majority of leaders. Senior police officer at Quetta Farrukh Ateeq confirmed that a police vehicle was targeted in the blast. Senior police officials said that the suicide bomber, who had targeted the FC truck, was well aware of the activities going on in the vicinity. Since the rescue operation was still on, the number of casualties may go up, officials said. 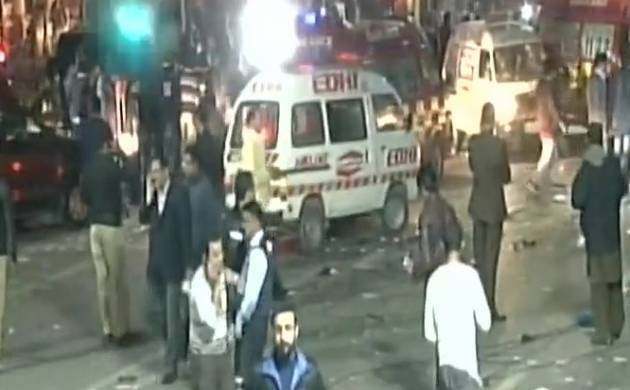 Hospital sources confirmed the death toll, saying at least six persons, including four policemen, were killed and at least 17 others injured in the explosion, the report added. According to sources, initial investigation suggested a suicide attacker on a motorcycle was attempting to target the Balochistan Assembly building but detonated his explosives near the high-security Red Zone area. A large number of security personnel had been deployed in view of the Assembly session. Police and rescue teams have cordoned off the area.